Nerf Blasters are among the most popular Nerf Guns right now! This one is on sale on Amazon! 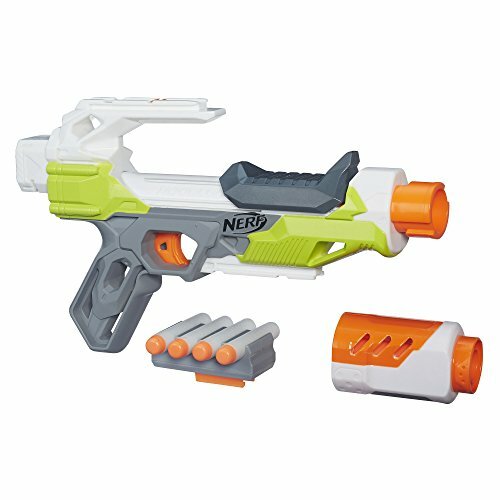 Hurry and get the Nerf Modulus IonFire Blaster today for $14.99 only $8.17 from Amazon! This product is available in standard or frustration-free (easy to open) packaging at different prices! Limit 3. Quickly see them all here. Boys can build their own blaster for each mission or battle with the Nerf Modulus IonFire blaster from Hasbro! Customize the blaster with the barrel extension and dart storage. Slide the dart holders onto the blaster’s tactical rails to keep darts within reach for quick reloading. Heading into battle? Customize with the barrel extension. On a covert mission? Remove the extension to create a stealth-sized blaster. The Nerf Modulus IonFire blaster fires one dart at a time and comes with 4 darts. Expand the customizing options with Nerf Modulus Upgrade Kits (each sold separately); with the full Nerf Modulus system, over 1000 different combinations are possible! Buy the Nerf Modulus IonFire Blaster from Amazon.